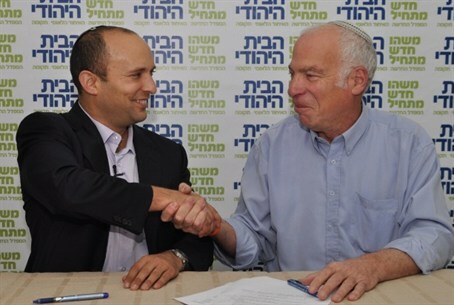 The two religious-Zionist parties agreed to run in a joint list, and chose the first 15 names. The heads of Bayit Yehudi (Jewish Home) and Tekuma signed an agreement Thursday that merges the two parties in a joint list for the 19th Knesset. The list is headed by Naftali Bennett of Bayit Yehudi, and MK Uri Ariel of Tekuma is in second place. Bennett will also be the party's senior minister, if it joins the coalition. Bennett and Ariel will be followed by Nissan Slomiansky, Rabbi Eliyahu Ben Dahan, Ayelet Shaked, MK Uri Orbach, Zevulun Kalfa, Avi Wurtzman, Mordechai Yogev, Orit Strook, Yonatan Shetbun, Shuli Mualem, Rabbi Hillel Horwitz, Jeremy Gimpel, and Nachi Eyal, in that order. Tekuma was one of the founding factions of the Ichud Leumi (National Union).